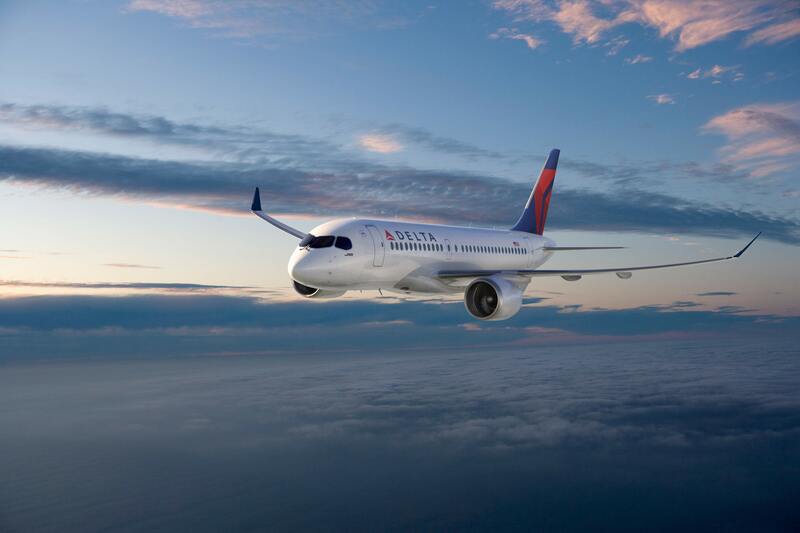 May 23, 2017, © Leeham Co.: Delta Air Lines shot down Boeing’s claim that Bombardier “dumped” the CSeries order, in testimony last week before the US International Trade Commission. Boeing seeks tariffs of nearly 80% on the importation of the airplanes to Delta. Boeing’s complaint is that the Delta deal made it impossible for Boeing to offer the 737-700 at a competitive price. Delta testified, however, that Boeing didn’t offer the 737, either the -700 NG model or the new MAX 7. Boeing said it didn’t offer the airplanes because it knew from the contest between Bombardier, Boeing and Embraer at United Airlines, that it could not meet the price point Delta wants. However, given the 737 backlog–all the way out through 2020–it’s unclear that Boeing had any delivery slots to offer Delta. May testified that the 737-700 is larger than then CS100 Delta ordered, in a different airplane category. “I can’t emphasize enough…the 737-700 is not a 100- to 110-seat aircraft,” he said. May testified that Boeing offered a combination of used aircraft, the Embraer E-190 and Boeing 717s. The 717s weren’t available on the timeline Delta wanted. Delta purchased the E-190s, only to decide afterwards to sell the aircraft itself. May also said that the 737-700 is used by Delta in a special performance role, but is otherwise uneconomical. Delta has just 10, all ordered in 1997 and delivered in 2008-2009. I think its fair to say DL aren’t very happy with Boeing right now. Does that mean that this issue is laid to rest or is there going to be a long, drawn out process with more twists and turns before we get to the end of it all? @Aero: Not laid to rest. Can Boeing gracefully withdraw, claiming they exactly got what they wanted? But did Delta say anything about the prices? That’ll be commercially sensitive information they will want to keep under wraps if at all possible. Boeing claims in their complaint, to which Scott provided a link in his original post on this issue on 4-27-17, to have derived the price paid by Delta for their CS-100’s by analysis of Delta’s financial statements. The following quote is from pages 116 and 117 of Boeing’s complaint. The often quoted price of 19.6 million per plane is what Boeing obtained after applying adjustments to the above “gross export price” using, they claim, USITC guidelines, to obtain the “ex-factory export price” See pages 117 to 120 in which Boeing is calculating production costs (constructed value) under USITC guidelines because they claim special circumstances apply which call for calculating the dumping margin in their dumping complaint (they also have a separate subsidy complaint) from production costs instead of from homemarket selling price. The following quote is from page 120. If the USITC rejected Boeing’s argument that production costs should be used to calculate the dumping margin, but otherwise ruled in favor of Boeing in the dumping complaint, then the dumping margin would be calculated from the homemarket price. Several posts on this issue have asserted that Boeing’s complaint ignores introductory pricing and start up costs. The production cost model used in Boeings’s complaint does in fact take into account such factors. You may agree or disagree with the details of Boeing’s model, but is is not true to say that such factors are completely ignored. The following quote is from page 124. • Boeing’s own experience on the shape of the cost curve for a new aircraft series. • An average list price discount for the first 206 aircraft of 50%. Given the list price of a 737-700 is $82.4 million and they sold that model to UA for about $22 million, Boeing assumption for discount is completely and utterly invalid. In fact, I’d be surprised if any 737 Max or NG is selling for more than 50% discount these days. 1. Assuming Cost of Goods Sold(CoGS) is the real benchmark to determine dumping as opposed to purely variable production cost, how to assign fixed cost between CS3 vs CS1? 2. Fixed costs such as R&D+cert(e.g. those expensive & time-consuming FBW software refinements+upgrades, cert tests for CS1 drastically reduced similar tests for CS3, etc. ), sales & mkting, manufacturing tools & infrastructure, etc. are hard to divide between CS3 and CS1 because all are shared between the pair. This is important due to fixed costs are usually a huge component in CoGS fm hi-tech aerospace program. 3. CS3 and CS1 hv been for sale for 9yrs so current order split is a good guide to est. long term order split between the 2 variants. Ratio is about 2:1 @ present. 4. Is long term order split the most reasonable way to split CSeries fixed costs due to more units of CS3 than CS1 will be built and therefore CS3 delivering more overall benefits derived fm those fixed costs? 5. If 4. is used to split fixed costs(i.e. 2/3 assign to CS3, 1/3 to CS1), CoGS for CS3 will be significantly diff than for CS1. 6. Due to 5., CoGS per unit in the AC deal will be much higher than in the DL deal. I’m not saying the above hypothesis is the correct approach but just pointing out the complexity of determining cost for the AC deal vs the DL deal when U start to straddle across 2 diff, though similar & related, products fm the same manufacturer. Could this, at least in part, be Boeing attempting price discovery? Target a deal where they didn’t offer in order to force Bombardier to reveal pricing, which could restrict Bombardier pricing/profitability in the future and assist Boeing in confirming competitive positions. Perhaps follow up with a claim in a deal where they didn’t offer and Airbus (especially), Embraer etc did and won. Well, turnabout is fair play. Has everyone forgotten Anderson not too long ago jerking BA’s chain on used B777 pricing? Nice for them to get a taste of their own medicine. Go Alaska Air! All manufactures use promotional pricing. If one side must release promotional pricing then all sides must release promotional pricing. Bombarder have taken a $500million charge on sales and perhaps will need to take additional charges. Boeing have now taken a charge on part of the 787 deferred costs. Perhaps more will come. The issue is that anybody who takes a charge, accepts a load or state aid can be regarded as dumping. So does the $7billion÷ and more tax breaks provided by Washington state for the 777X constitute dumping? “Home market” is a pretty meaningless term in this business. Take the 777-300ER as an example. Boeing has 807 orders for the 777-300ER aircraft, but only 34 of those are from US airlines (2o from AA and 14 from UA); or just 4.2 percent of 777-300ER orders coming from Boeing’s home market. Now, I’d bet that United Airlines is paying much less for their 777-300ERs than what Air Canada payed for theirs. Whats your point. That the 77W isnt being dumped? Obviously for the US trade point of view, it would only be concerned with products being imported into US to be looking at the anti-dumping provisions. There is no provision for another country to complain about US prices being less than what they have to pay. My point is that American carriers account for less than 20 percent of Boeing’s backlog and that there would have been no 777-300ER in existence if Boeing was depending on its “home market” for that size aircraft. It would also be hard to accuse Boeing of dumping 777-300ERs in the global market place, because the home market for that aircraft only accounts for 4 percent of total orders. You may think that “Home market” is pretty meaningless; however, in U.S. trade law “Home Market” has the following exact and precise meaning. The above quote was copied from the “Glossary of Terms” in the 2015 Anti Dumping Manual of the Enforcement and Compliance Division of the USITA at the following link. The USITA is different from the USITC. Broadly speaking, the USITC determines whether imported goods have caused injury to US industry, and the USITA determines whether prohibited dumping or subsidies are occurring. The hearing that Mr. Hamilton quoted from in his post was conducted by the USITC. If the USITC issues a preliminary determination that Boeing has suffered injury from Bambardier’s US sales activity (this is scheduled to occur on 6-12-17), the case will then proceed with USITA who will assess whether prohibited dumping or subsidies have occurred. Since the above quote from the USITA manual states that “Home market sales are the preferred basis for normal value”, and normal value is used to determine whether dumping has occurred, I would think that for any business or government that is under USITA or USITC investigation, and who cares about winning their case, “Home Market” as defined by the USITA and USITC is highly meaningful and important. See below for part of the definition of “Normal Value” from the above referenced document. Normal value is the adjusted price of the foreign like product in the home or third-country (foreign) market, or the constructed value of the subject merchandise. The Department compares the normal value to the export price or constructed export price to determine the margin of dumping, if any. Perhaps the best outcome would be if the US would shut out foreign competitors to Boeing in the US market, and if Boeing would be shut out of the global market. Then, Airbus, Bombardier, COMAC, Embraer, UAC etc. could share the rest of the world market. But where has BBD sold CS100 in Canada in a substantial sale? Home market sales for the CS1 has never occurred. As a result, the key allegation about BBD has sold CS1 for more in home market than in the US(Or anywhere else) has no reference to serve as evidence . The closest BBD has ever achieved to sell CS1 to a domestic buyer was a LoI /conditional order with Porter….a deal no one now expect will be firmed thx to Billy Bishop airport will not lift the ban on jet ops(i.e. the main condition for the CS1 order). USITC might have responded to Boeing’s complaint with an investigation of sales of the CS100, or even more narrowly an investigation of sales of the CS100 to Delta (thus excluding the competition won by the 737-700 against the CS100 at UAL – had this been the case I would have found Mr, Hamilton’s assertion that Delta testimony “shoots down” Boeing’s case far more convincing); however, they didn’t . The USITC responded to Boeing’s complaint with an an investigation of imports of “100 to 150 seat large civil aircraft from Canada”. Until or unless the USITC narrows the scope of their investigation, the CS 100 and Cs 300 are both within the scope of the investigation, since both are 100 to 150 seat large civil aircraft from Canada. Below is an excerpt from the USITC’s notice of investigation which can be found at the link following the quote. Below is the definition for “Similar Merchandise” from the glossary of terms in USITA’s Enforcement and Compliance Division’s Anti Dumping Manual, which has a brief discussion of the use of non-identical merchandise (such as Cs100 vs. Cs300) for sales comparisons. The USITA’s Enforcement and Compliance Division’s Anti Dumping Manual may be found at the following link. The following excerpt from Boeing’s complaint, to which Mr. Hamilton posted a link in his original post on this issue on 4-27-17, outlines how Boeing thinks the Air Canda CS300 sale should be treated by the USITC and USITA (see pages 120 and 121). differences tend to increase the cost and complexity of production. As set forth in Exhibit 42, Tab 2, Boeing estimates that this difference in physical characteristics equates to a variable cost difference of USD [censored ] . As shown in Exhibit 42, Tab 2, this amount falls well within the 20% difference in merchandise upper limit allowed by the Department for price-to-price comparisons. Will Boeing only apply the manufacturing cost difference when pricing the 737-7.5 & 737-8? Or Airbus with the A320 vs. A321? Such an argument is simply attempting to prey on the ignorance of the judiciary in the matter. It also reflects poorly on the standard of reporting if certain others believe it to be a relevant reflection of pricing reality. Alain Bellemare, the CEO of Bombardier, repeated more than once that its current priority is to reduce the cost price of the CSeries. This is the only thing he controls to make money. It began by reducing administrative costs or structural costs. It is likely that in the very near future, costs will fall. And if ever the Chinese COMAC takes a stake in the joint venture of the CSeries, one can imagine to delocalizations of manufacture of components in China, which will reduce the cost price. Indeed, that is what should be remembered: currently Bombardier is working to bring down significantly the price of its planes. And this fact alone is disturbing for Boeing because it can no longer justify inflated prices within the framework of a duopoly. Boeing is an old man with outdated engineer ideas who only wants to use the atomic weapon to crush an innovative and agile fly. The commercial future of Cseries is not so black. On the contrary. And then, there is not only the United States as a potential market for Bombardier aircraft. Finally, Delta, like other US airlines, is likely to put pressure on multiple political levels to break this duopoly that eventually annoys in the end. Boeing has missed the opportunity to stay competitive in the smaller aircraft market by keeping its 737 way too long. Competing with the A-320, a 30 year old design was feasible but hardly possible with the CSeries or any new aircraft. What they are doing is a desperate move in a critical situation when we look at the issues they are facing with the high cost of the 787, the aging 777, the disappearance of the 747. They need to design from scratch and for that they will have to streamline and they should pull out of the smaller narrow body market . The 737 is competitive, no one would buy it if it wasnt. Planes arent cars which are totally redesigned after 8 years or so. Boeing had the winning formula with the 6 a breast fuselage when it was introduced, everything else has been changed since. I don’t think you can really say Boeing ever competed in the 100-110 seat class aircraft. The smallest 737s are very heavy for the mission. Have you forgotten the Boeing 717 ? Delta likes them a lot with nearly 100, none of them it bought new. That’s not a Boeing aircraft, really: it’s a Douglas DC-9. Its also fair to keep in mind that Delta (Anderson) had Boeing bidding against Airbus on the 787/A330/A350 deal. When all was said and done Delta had not intention of buying the 787s. I think what this is about is the C-300 and 500 which will indeed step into the low end of Boeings offering. On the other hand the 737 is still heavy for that area. Got a love the cat and dog fight, Boeing is being stupid, they won’t win in the long term and Delta is one of the key customers for the Boeing MOM. And in other news the A330NEO continues to be delayed. Boeing will probably sell more 787s. Completely off topic and not news – the additional slip by a few months was already announced (and discussed here) almost a month ago. Good luck in any case selling 787s on a total slip of way less than 12 months for the A330neo when the 787 itself isn’t available short- or medium-term, either. Actually, plenty of vacant 787 slots now available for delivery in about 3yrs per leehamnews.com analysis done recently……hardly a long wait and in fact, a pretty normal order lead time for any widebody type with a matured supply chain. In contrast, current order lead time for a 350 is a diff story…. If your A330neo is getting delivered in mid 2018 instead of late 2017/early 2018, a 787 slot in 2020 isn’t really going to help you an awful lot. If you were thinking about leasing A330neo in 2018, then the 787 is an obvious candidate that probably has better availability – but 2018 was never the year the A330neo would have hit the leasing market in numbers (not counting orders by leasing companies that have already been allocated). So getting back to TransWorld’s post: additional 3-5 month A330neo delay still old news, still off topic for this article, and still not likely to generate additional 787 sales. We can talk again if first delivery slips way into 2019. Boeing should have bought the C-Series program. Maybe it still could. The 737 has come to the end of its viability. Indeed, it’s likely been kept alive as a program well beyond what would be optimal. Boeing should concentrate on creating an all-new narrowbody family of aircraft that essentially starts where the C-Series leaves off. A family of aircraft with say, 200, 250 and 300 seats in 28-inch ULCC pitch (significantly less in full-service airline pitch) and perhaps two different wings (intra and inter continental). Make it just wider than the A320. Then the C-Series can slot in below. Everyone’s happy. The C-Series seems, from a technical standpoint, to be a pretty good aircraft. With Boeing backing it would be quite a competitor. Theoretically, a product range comprise of CS1, CS3 and the mythical CS5 @ the low end plus the 797-6 and 797-7 (https://leehamnews.com/2017/05/10/airbus-can-kill-boeing-797/) @ the high end is a formidable portfolio. Except the 321Neo /Max9 /Max10 space, they can replace all Boeing products currently in production or development that are smaller/with less range than a 788. In reality, the only trouble is that Boeing $ is already locked into the Max biz plan for the nex 10yrs @ least. No one really cares about Bombardier. They are a train wreck. What’s wrong with the 330NEO.? No matter what’s happened before Delta will always seek the best deal they can find, re: MoM. It’s just business, not blogosphere rantings. For the 737 to be so dead they sure seem intent to work down the massive backlog over the next ten years. There’s probably a strategic business reason for that, too. If they are such a train wreck as you pretend, then we’ll more likely see a sale to COMAC if Boeing is succesfull in blocking CSeries from the US market. Québec province would sell its CSeries stake with a profit. The Chinese market would open more for the CSeries . More financial backing for the CSeries. With this BS protectionist/hypocrit complaint, I would be happy the Chinese takes market share from Boeing. Disclaimer: I own BBD stocks, and I hope to make a profit if COMAC buys into BBD Aerospace. Wont be a sale to Comac. Canada,Quebec and northern Ireland have too much invested for them to see their jobs and development along with IP go to China. I think part of the centre fuselage comes from China now, thats all it will ever be. It’s either China or bankruptcy/endless bailouts. Their choice. The Cseries business is now partly owned by Quebec, Bombardier cant sell something that isnt theirs to sell. The last few years have been only a the usual launch problems in a 25 year + program selling what is a good plane. It makes a lot more business sense than something like Uber! I do hope that COMAC purchases the CSeries program off of Bombardier if the CSeries planes are blocked from the U.S. Perhaps Bombardier and COMAC can have a C929-like venture and jointly design a new Turboprop and/or CRJ-like plane (the ARJ21 seems like a failure). COMAC has expressed interest in having an entire range of aircraft in every size category, and aircraft smaller than the C919 will still be on the table. Chine need Bombardier Aviation and Transport to be in position in Europe with Transport, also they need Bombardier Aviation to be more accepted on international aviation. So I think for China, Bombardier is a very important key to be THE Transport of the world! It is not only aviation with C Series. Ex mil engineer: I dunno why this is so personal to you other than your stock investment. Bbd and Pratt are not good companies at managing new programs, imho. Boeing is fighting a defensive battle I guess, over overt subsidies. I don’t think they’re wholly innocent by any means, nor do I support the state of washingtons silly policies or labor laws (unlike this blog). All of that talent and expertise you fear the Chinese buying is for sale on individual bases for much lower prices (and with bombardier layoffs I think much of it is vastly discounted). With the public disclosures of patents and free labor laws I really don’t think the Chinese lack data on how to build carbon wings, it’s just a matter of when they ramp up. The talent and expertise is not as easy to acquire as you say. Just look at Shenyang Aircraft Corporation (SAC) performance with the CSeries fuselage main central section. SAC spent a fortune in attempting to make it right. They are still not there yet… (Despite having all the blueprints prints etc). Most of the work was shifted to Montreal and Belfast litterally overnight. And there was no problems finding here the right skilled workers for that unplanned workload. They could use BBD certification facilities / ressources to FAA certify its C919 (if it’s certifiable…). No wonder Mistsubishi moved the MRJ flight testing in North America, the expertise is here. They could use the automated Belfast composite wing plant to produce the wings of any future projects – like that Russian / Chinese C929. The Chinese would save many years (and lot of $$$) in their goal of acheiving world class commercial aircraft manufacturer status. Plus the CSeries then gets all the required financial backing, plus a bigger share of the Chinese market. The Quebec government would recoup easily its investment as it only paid US$1B for 49.5% of the CSeries program. Who is the Customer? Did the offeror submit a complaint proposal? By that I mean, buy airplanes made in the good ole USA, and fly on airplanes made in the good ole USA. When one airline ( DL) continues with orders for nearly all airplanes produced by foreign owned companies, (81%) maybe it’s time to find another airline on which to fly (UA or AA). 23% and 50% respectively, of airplanes made by foreign owned companies.